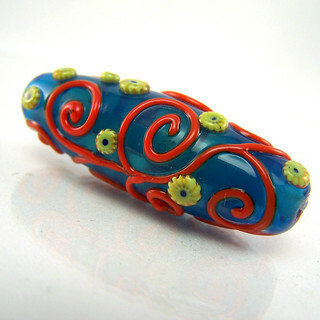 I actually haven't been as busy in my lampwork studio as this post might suggest. Rather, I've just now gotten some time to photograph and post work from about two weeks ago. Regardless of it's age, I think these are lovely beads nonetheless, and worth showing off. I hope you enjoy! Tidal pools are full of dense, dynamic, vibrant life, both visually and textural stimulating. This bead strives to capture that with a mix of densely placed embellishments of different textures and bold, vibrant colors. Yellow, my favorite color, is so full of life, totally representative of the fun, busy days of summer. The playful, sinuey waves and coils of lime green evoke a playful sensibility, highlighted by the bright orange dots that accentuate the movement of the lines. Includes lots of bright hand pulled murrini. 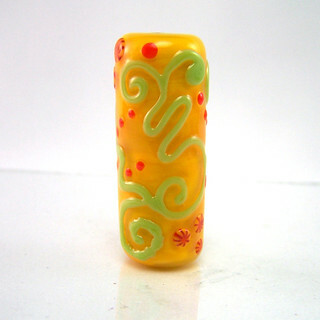 This bead, unlike its yellow sister, is a little more mellow. The blue waves and coils are reminiscent of cool streams, and the green murrini dotting the bead remind me of an umbrella on a cool, fruity drink. 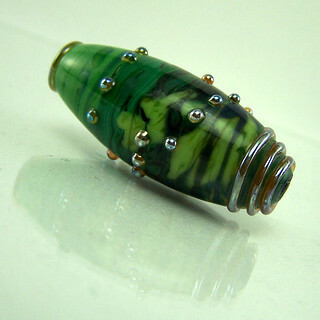 The cool translucent aqua base color of this bead are soothing, liquid, like the thawing waters of spring. 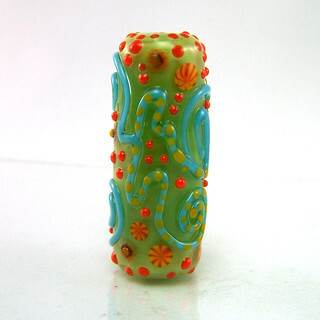 I love how the orange scrollwork and green handpulled murrini bring life and warmth to this bead. an organic base of many shades of green, embellished on the surface with golden stringer work and dots. In my mind I'm trying to keep two holidays ahead, but I'm Irish, and my son's birthday is the day after St. Patricks Day, so it's a favorite holiday and I can't seem to move all the way forward to Easter. So, I've combined them. I really like your recent work but I am especially drawn to the first and last beads. 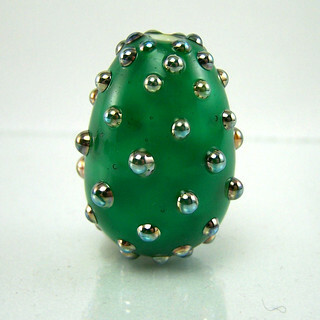 The colors of the first bead are really "me" and the last bead--despite being shaped like an egg and dotted--reminds me of nopales. 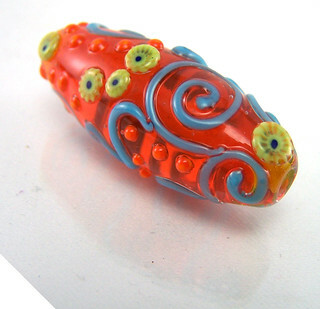 After I got the first bead out of the kiln and looked at it, I couldn't believe how busy I made it. It's starting to grow on me, though. It makes me think of tidal pools.